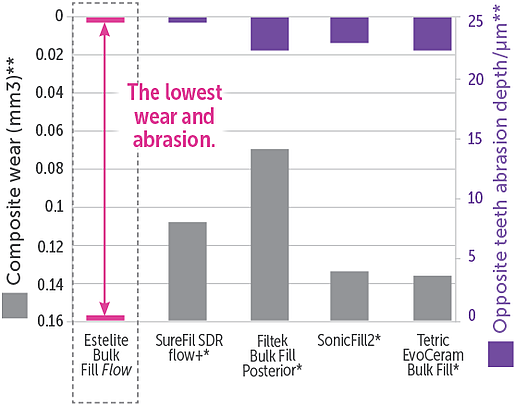 A recent evaluation by Dental Product Shopper examined Estelite Bulk Fill Flow through a panel of doctors. 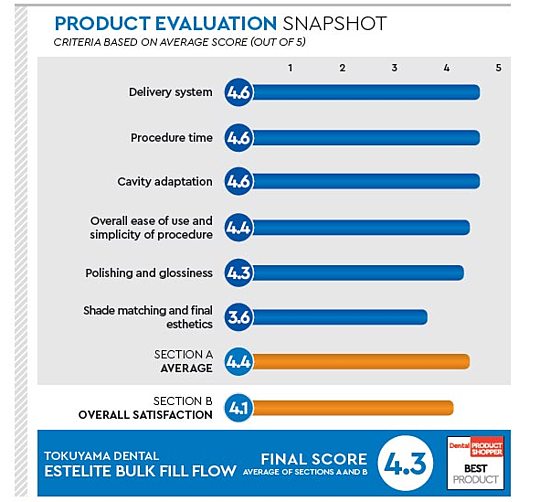 The final result was an excellent rating of 4.3 out of 5, making Estelite Bulk Fill Flow a Dental Product Shopper Best Product. 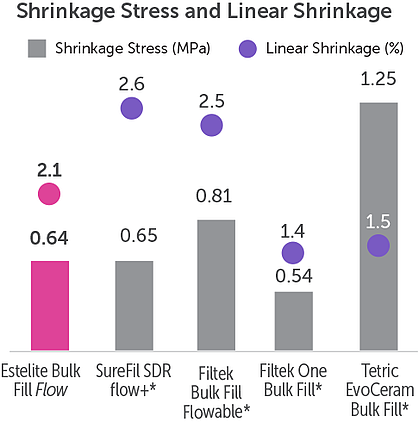 Estelite Bulk Fill Flow is a high-quality bulk fill material that enables doctors to complete large restorations in a shorter and more efficient amount of time. Tokuyama Dental perfected this material through its spherical fillers, which maintain the strength of the composite without compromising the material in terms of shrinkage stress. Estelite Bulk Fill Flow is an excellent composite material to try if you have been considering using a bulk fill material for your restorations. Read the full evaluation on Dental Product Shopper's site by clicking here. To redeem your Buy 2, Get 1 special offer of Estelite Bulk Fill Flow, purchase 2 units of Estelite Bulk Fill Flow from your dealer, and email or fax us at info@tokuyama-us.com or 760-942-7212 with your invoice. Indicate the promo code EBFB1 and your desired no-charge goods on your invoice to fulfill this offer. Any incomplete submissions will not be processed. *Limit three offers per doctor. For no charge goods, purchase must be made from dealer between 4/1/19 and 4/30/19. Purchase must be made on ONE invoice. Invoices/redemptions must be received no later than 5/15/19 to claim no charge goods. To receive your no charge goods, fax, mail, or email your invoice and no charge product desired to: FAX: +1 (760) 942-7212. MAIL: 740 Garden View Ct, Suite #200, Encinitas, CA 92024, Attn: EBFB1 Offer. EMAIL: info@tokuyama-us.com. Indicate promo code EBFB1 on invoice. Incomplete submissions will not be processed. This offer may not be combined with any other Tokuyama offers. No charge goods fulfilled through Tokuyama. Offer can be used with Estelite Bulk Fill Flow. No charge goods must be of equal or lesser value. While supplies last. Please allow 2-4 weeks for delivery of no charge goods. Offer valid in US and Canada only. Participating doctors or dentists are obligated to properly report and reflect any bonus product, rewards, rebates, discounts or other benefit they receive on their submissions to Medicare, Medicaid, state or federally funded healthcare program and/or private insurance. All rights of evaluation reserved by Dental Product Shopper.